No home runs yet. The two that stand out for me, Person of Interest and A Gifted Man, have problems. Person of Interest really grabbed me, but it looks like an interesting premise is still ultimately going to be a procedural. A procedural with different terms, but nonetheless, every week they’ll stop a bad guy of some sort and that won’t feel exciting. The pilot did though, so I’m hoping I’m completely wrong. It felt great to be engaged again. A Gifted Man came out of the blue for me. I’ve heard nothing about it, didn’t know what it was about. I loved the lead. His dead ex-wife is too earnest/saintly/savior-y, though. Very annoying. It’s not the actress, it’s the writing. Give her some real human emotions and lines, instead of the all-knowing, all-loving, all-perfect gazes and guidance stuff. I would have left that person too. New Girl, it was good enough that I will wait and hope that it develops. Two Broke Girls had it’s moments, but I don’t know. Terra Nova was the biggest disappointment and Ringer comes in second, but I will give both more tries. My highest hopes so far are for Person of Interest. I tried to visit Whitman’s birthplace when I was out in Huntington, but it was closed. I felt bad for the cat left alone inside. I don’t think it has started yet, but do you think GRIMM looks like it might be interesting? Yes!! Also, isn’t one of the Buffy alum writers or producers part of this? I can honestly say that I never saw a single Buffy episode! I know, I’m a freak. It’s never too late to enjoy them! But I can understand the feeling that there’s just too many seasons and who has the time? There’s always time to watch Buffy! I was disappointed in Ringer too, but will try a couple more. I couldn’t get past how so very unrealistic of a storyline it is for one. I just happened upon A Gifted Man too, something to watch before Fringe! Why does that new guy on Fringe, the cop, look familiar? Was he on before? Yes, that’s been bugging me too. Was he on this show early on maybe? Ok, after a little Googling, I found out that Lincoln is the character from the other universe who was blown up and was all burned, then recovered slowly(due to treatments in the chamber). He was part of their Fringe division. I remember now, but geez, why didn’t I remember before? So, why he’s not part of the Fringe division from the other side now is still a mystery, but that’s the nature of the show. Good work!! But did you see last night’s? Don’t read my next question yet if you haven’t. Didn’t Broyles, the boss of the division, die in the other universe, as a consequence of helping Olivia escape? Yes, I watched it last night and yes, Broyles did die helping Olivia so everything is very topsy turvy right now since Peter stopped the mayhem temporarily. Who knows where things will go with this crazy show! I do miss Peter though, so hopefully they’ll transition him back more permanently soon. However, if he never existed, I’m not sure how that will happen. I’ll be watching to find out! I just called the Walt Whitman home. 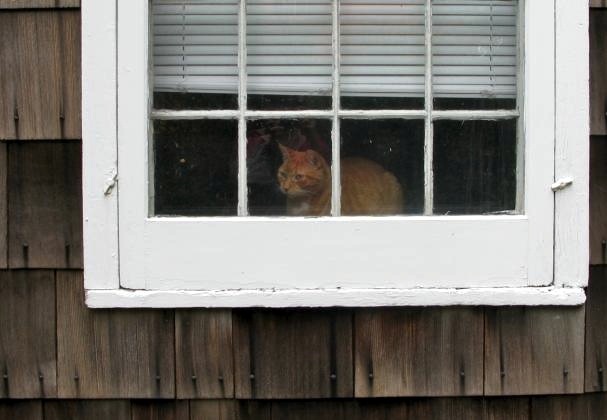 The orange cat belongs to the caretaker and is a 100% house cat. You were probably looking in on the care taker’s abode and BTW, how awesome a job would it be to be the Walt Whitman Home caretaker?? There is a quasi-feral cat that roams the prperty and is called “the Walt Whitman Cat” and he’s black and white. I told the kind lady on the phone that I’ve always wanted to trek out to see W.W.’s home but now that I know there are TWO cats on view I REALLY can’t wait to see the place. Hi Vivian! Thank you so much for finding out the story on that cat! I am happy to know he or she has an owner. Betsy, I want Peter back soon too.